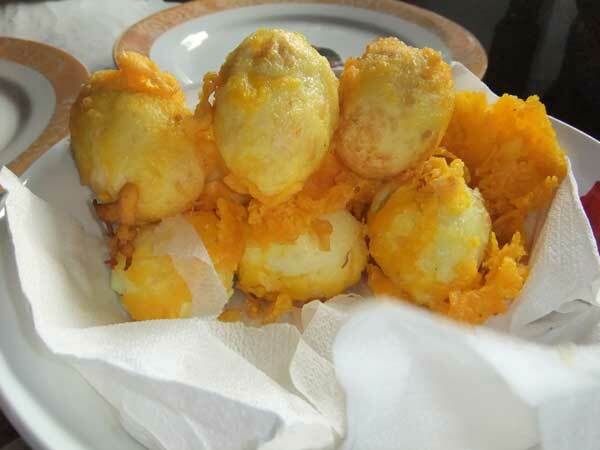 Tokneneng is deep fried pre-boiled chicken egg with crispy orange coating. The orange coating is a mixture of flour, baking powder, food coloring (orange), and small amount of water. In a bowl, mixed all the ingredients well and evenly coat each egg before you deep fry. Place them in a bowl with paper towel to absorb excess oil. Serve with your favorite vinegar and chili dip. This entry was posted in Healthy Snacks and tagged kwek-kwek, tokneneng on July 13, 2011 by Yami. Tokneneng is one of my favorite streetfoods. Some of them are fishball, kwek kwek and kikiam.